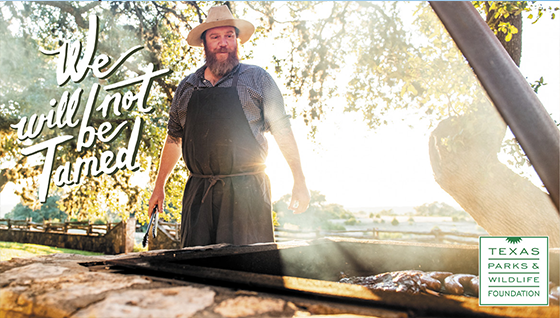 Chef Jesse Griffiths is obsessive about sourcing food locally for his award-winning Austin restaurant, Dai Due. “Fresher is better, and people can taste the difference,” he says. “People want to know where their food is coming from." His obsession led to him taking up hunting as an adult, and he is passionate about the pursuit of game for the table. He also runs the New School of Traditional Cookery, which offers courses that combine a culinary experience with hunting or fishing. “To me, that’s what hunting and fishing is all about. It’s catching dinner and feeding families. It can be done on a budget, it can be done no matter who you are or where you are in this state." And thanks to Texas Parks and Wildlife Foundation’s (TPWF) support, the number of Texas Parks and Wildlife Department’s Wildlife Management Areas is growing. More than 700,000 acres across the state enable the public to learn and experience the natural part of Texas, including hunting and fishing. Griffiths is an ambassador for TPWF’s We Will Not Be Tamed campaign. The campaign calls us to appreciate the wildness of Texas, the vastness of our Texas spirit and why we should be inspired to conserve it. Chef Jesse Griffiths has remade the modern restaurant with a singular focus on locally sourcing food for his patrons. But putting food on your table isn’t all Griffiths wants to accomplish. He wants to teach you how to do it, as well. 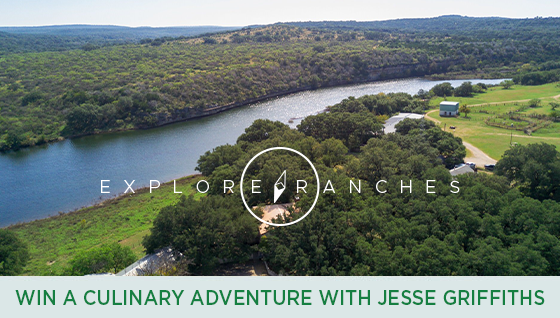 When you join Texas Parks and Wildlife Foundation (TPWF) before March 8, you’ll be entered into a drawing to win a one-of-a-kind weekend with Jesse at the headwaters of the South Llano River for a wild culinary retreat on April 26-28, 2019. * This extraordinary opportunity to experience the Texas Hill Country and learn from a master is provided by TPWF brand partner, Explore Ranches. We hope this opportunity will inspire you to join TPWF today. *The price of membership pays for TPWF membership only and not for the chance to win the culinary retreat. Members who join or renew by March 8 are automatically entered in the drawing. Click here for giveaway rules and additional details. 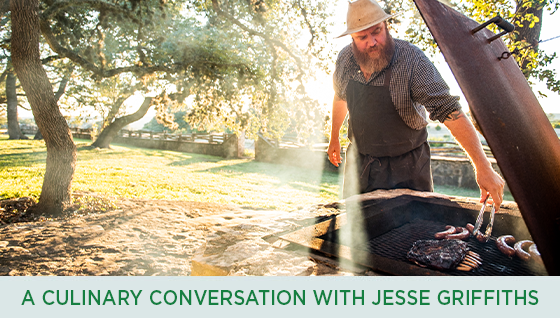 Jesse Griffiths has been a trendsetter in the Austin restaurant scene for more than a decade. Radio and podcast host Cecilia Nasti has been following sustainable food trends in Central Texas for years. We caught up with both of them recently for a culinary conversation. Listen in on our latest podcast. 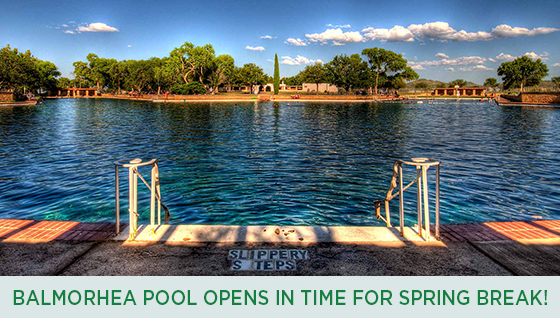 Balmorhea State Park’s iconic San Solomon Springs pool has reopened to the public in time for swimming season following several months of restoration work. The pool was closed last May after damage to the concrete apron under the diving board was discovered during the pool’s annual cleaning. The repair project cost $2 million. Apache Corporation partnered with Texas Parks and Wildlife Foundation (TPWF) to help fund the repairs, and the effort was jump-started with a $1 million challenge grant announced by TPWF and Apache in August 2018. Apache pledged to match all donations dollar-for-dollar up to $1 million. By Jan. 17, thanks to your generosity, more than $1 million had been raised. “Apache is proud to have been one of the many companies and individuals who stepped up to support the treasured pool at Balmorhea State Park in its time of need,” said Apache Corporation CEO John Christmann. “Texans from far and near, including our employees and partners in the region, can once again enjoy the pool with friends and family thanks to the leadership of the Texas Parks and Wildlife Foundation and the generosity of so many."